Daniel gives Hana some tips about hanging out in his hometown of Santiago. Daniel: Hello! How are you? Hana: I’m fine, thank you. I heard you’re from Chile. Hana: Where are you from in Chile? Daniel: I’m from a city called Santiago, that’s the capital. Hana: Ah, I see, I've never been. What do you recommend? Daniel: Well in Santiago there are a lot of things to do. First, we have a lot of historical places. There are a lot of Spanish buildings. But also Santiago has turned into a really modern city, so we have a lot of shopping malls. There are a lot of really modern tall buildings. But on the other hand, we still keep a lot of parks. There is a lot of nature in Santiago. And since Chile is so narrow there is also the Andes Mountains right next to the city. So that is really, really nice. Hana: I see. How’s the food? Daniel: Well Chilean food is really good. And the good thing about being in Santiago is that there are a lot of restaurants where you can try really local and traditional food. And also a lot of cafes that you can go have a drink, to have a coffee, relax with your friends. 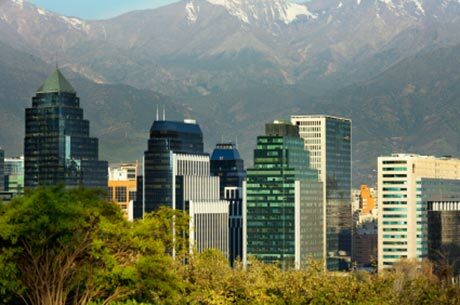 So there are many, many things that you can do if you visit Santiago. Hana: Wow, it sounds very interesting. I’m from a city called Santiago, that’s the capital. Santiago has turned into a really modern city. He has turned into a really nice young man. We hope to turn the old building into a dance club. There is a lot of nature in Santiago. There is not a lot of crime in this city. There are a lot of jobs now in biotechnology. And since Chile is so narrow, there is also the Andes Mountains right next to the city. Since the party is over, I will go home. Let's stay home since it is cold outside. There is also the Andes Mountains right next to the city. My house is right by a park. Let's drive the bus is crowded at night. Paris is the of France. Even bad kids usually good adults. He has a house by the beach.